If you ask 17-year-old Dulaney High School junior Anastasia Vialov what it means to be a Kiser Scholar, you are in for a long response, as this young jockey and show ring rider has a lot to say. And most of it is about what an incredible experience race riding has been. Anastasia has become an accomplished show rider and this past season won the Baltimore County Horse Show Association’s Pleasure Horse Championship with Betty’s OTTB, Prideland. They also earned that same year-end title in 2013. Prideland was actually one of Anastasia’s steeplechase mounts as well this past year. 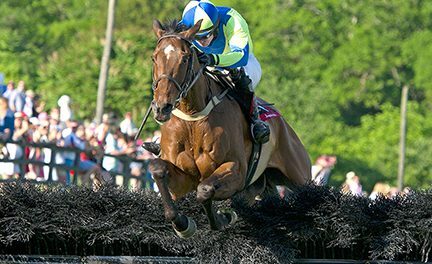 She rode him to a third place finish in the Junior Field Master’s Chase at Green Spring Valley Point-to-Point and a sixth place finish in the Junior Field Master’s Chase, Thoroughbred Horse division at the Maryland Junior Hunt Cup. The 2002 gelding was bred in Maryland by Dark Hollow Farm and won nearly $160,000 on the flat track before being retired and finding his way to EHM Stables. In 2013, Anastasia and Count Chocula entered their first race, and won. That was the Medium Pony Flat Race at the Green Spring Valley Point-to-Point. Next they won the Medium Pony division at Chasin’ for Children and then again at the Maryland Junior Hunt Cup. The pair ended the 2013 season with a second place finish in the Junior Field Masters Chase, Medium Pony division at the Howard County Cup Races. The pair came out again in 2014 to a nearly perfect winning season. They won at Green Spring, the Maryland Junior Hunt Cup and Potomac Hunt Races and finished second at Chasin’ For Children and the Howard County Cup Races. In only two seasons of race riding, Anastasia has won six times, finished second three times and third once for a win percentage of 46.15%. Pretty impressive for a show ring rider. Betty feels Anastasia’s show hunter background is what has helped her be so successful in the race world. “The flat work helps her to know the feel of the horses. She has also learned to have patience and to see where the horse is going to jump.” She added that by not having her own horse, Anastasia has actually become an even better rider by riding many different horses and ponies and learning how each one is an individual. Anastasia, pictured here with trainer Betty McCue, has also found success in the show ring. As part of winning the Kiser Scholarship, Anastasia earned free tuition for the Junior Steeplechase Camp put on by U.S. Pony Racing. The campers visited several steeplechase training facilities and tracks in Maryland, Virginia and Pennsylvania. While in Maryland, Anastasia had the opportunity to ride with champion trainer Jack Fisher. “He helped me with holding strong horses and getting them to go at the speed I wanted,” she said. Next was riding with Doug Fout in Virginia and then with Katherine Neilson in Pennsylvania. “I got to ride Super Saturday while there which was super cool!” Super Saturday, owned by Irv Naylor, won at Fair Hill, Howard County and Shawan Downs in 2014. Betty agrees saying, “Anastasia and these girls have made this a team sport. They help each other with the ponies and become each other’s trainers.” And that is really what being a junior race rider is all about isn’t it? Ponies, horses, friends and fun… and learning how to be a better jockey and horseperson all at the same time.